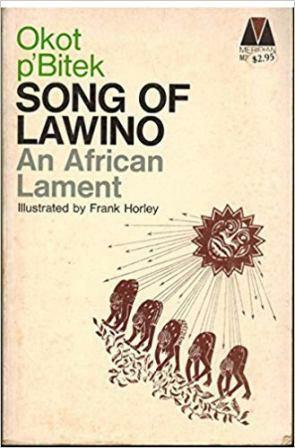 Song of Lawino is a poem about an African woman’s cry against her husband’s abandonment of the past in favour of western traditions. Lawino, a non-literate woman, says “Husband, now you despise me / Now you treat me with spite / And say I have inherited the / stupidity of my aunt /”. Her university-educated husband has adopted Western ways, rejected her, and taken another, Westernized woman. In there is a mixture of the traditional Africa practice of polygamy that is prevalent of the author’s Acholi’s culture however, instead the husband has chosen to favour the ‘new’ wife instead of treating both wives equally as culture would dictate. Song of Lawino was initially written in Acholi, one of the Luo dialects in northern Uganda in 1971 but later given an English translation by its author who according to his own words clipped a bit of the eagle’s wings of the original Acholi poem “and rendered the sharp edges of the warrior’s sword rusty and blunt, and also murdered rhythm and rhyme”. Although the work was turned down by several British publishers, in 1966 it became a bestseller. In 2001, Okot’s good friend made another translation of song of Lawino which he claimed was closer to his old friend’s Acholi version called In Defence of Lawino. The poem uses the literary device of a female character to address issues that were facing Africa at the time. When Okot p’Bitek wrote this poem Africa had recently been liberated and there was a question whether or not it should keep its African values or look to the West for new idealsSong of Lawino after publication was quickly translated into other languages and has become one of the most widely read literary works originating from Sub-Saharan Africa, and is more known for its scathing display of how African society was being destroyed by the colonization of Africa. Song of Lawino was followed by Song of Ocol published in 1970, in which Lawino’s husband responds to her. “Mother, mother, / Why, / Why was I born / Black?” p’Bitek introduced a style that became known as “comic singing,” in his famous poem. The poem itself echoes the author’s generation, that had absorbed early native culture during the colonial period, but then had received a British education. P’Bitek’s own choice was to take a stand against Western infiltration and defend Acholi traditions and customs. Born in 1931, Okot p’Bitek passed away on July 20, 1982.
are not songs in any literal sense. You cannot sing them. They are not simply a written version of Acoli songs. Acoli songs do not grow to book length. They are one or two verses repeated with musical accompaniment. [...] They do ot use rhyme or the regular rhythm used in Wer pa Lawino. The lengthy poem Song of Lawino, in particular, is a lament and denunciation one can imagine being declaimed, if not sung. For all the (local) universality of its arguments, it is not a communal work but an individual and personal one, the poet giving voice to a strong leading figure, Lawino. It is a litany of specifics, bitter complaints about her husband, Ocol -- even as their individual differences are representative for two camps, one espousing the entirely traditional (Lawino), the other looking only towards a European-culture-guided future (Ocol). In Song of Lawino Okot replaces the regular rhythm and rhyme of the Acoli version with irregular free verse in the English version. Clearly, this gives a different feel to the work, but it seems reasonably successful. Lawino's expression hammers home her complaints in stark, quick succession -- though one wonders whether the regularity of rhythm and rhyme in the original suggest a much more tempered argument: as is, the clipped, rapid-fire English gives a very heated feel to Lawino's expressions of frustration. Lawino is Ocol's first wife, and the mother of his first children. Now educated -- in the Western sense: he "Has read at Makerere University / He has read deeply and widely" -- and religious -- again in the Western sense, having become Christian --, Ocol sees everything about his origins as backward, and something to distance himself from. He has tried, and apparently managed quite well, to reinvent himself in the Western mold, complete with a European name -- Milchizedek Gregory ("It sounds something like / Medikijediki Giriligoloyo", Lawino thinks) -- and a new wife who understands these new ways. Among the reasons he rejects Lawino is: "Because, he says / I have no Christian name. / He says / Lawino is not enough. With the mud in their feet. Among the many areas of disagreement is about time, Ocol angry at Lawino because: "I cannot keep time / And I do not know / How to count the years". For Lawino, things happen when the need and circumstance arise: the child is fed when it's hungry (as opposed to fixed, regular mealtimes), or goes to sleep when it is tired. Ocol's life, meanwhile, is ruled by precise schedules -- and by the baffling grandfather clock whose: "large single testicle / Dangles below" (in one of Okot p'Bitek's most inspired images). But I do not despise their customs. Why should you despise yours ? Yet ultimately she too seems to judge reflexively: for Ocol all things Western are unquestionably superior; in reaction, she finds only flaws (and no potential positives) while wholeheartedly endorsing the entirely traditional. There is no middle ground here -- as, indeed there is no discussion: these are the songs of two individuals presenting their positions. He refuses to give me a chance. My husband has blocked up my path completely. Ocol's treatment of Lawino does seem outrageous. He is in no way supportive, and seems to make no effort to convince Lawino of the superiority of his newly-found ideas and ways. He lives (and lords) by fiat, the traditional so hidebound and silly that it can be dismissed without explanation; he is not in the least responsive to Lawino's plaints: "I cannot understand all this / I do not understand it at all !" Lawino makes some efforts to learn about and try to take up some of Ocol's ways, but finds a darker side lurking there too that Ocol seems completely blind to. Into two hostile groups ? His position as presented here is even less nuanced than in Song of Lawino. With religion playing less of a role, the divide is presented even more starkly as simply between the old and forgettable (Africa) and the new (European and Western ways). Ocol's position is so extreme as to be indefensible; Lawino's, while less so, also leaves little room for compromise. Yet, as Heron observes in his Introduction: "These two poems are not the thesis and antithesis of the argument, from which the reader can deduce a synthesis". Nevertheless, in their frustrated, extreme opposition the two do suggest possible middle ground: Okot p'Bitek leaves it as a vacuum here, but there is much room for positive advancement that does not neglect the traditional. The world-views of Song of Lawino and Song of Ocol are so polarized that neither can be embraced. Lawino's position is the more sympathetic, because she at least expresses some openness to trying to understand, while Ocol has simply cut himself off from both his (and his continent's) past and from any constructive dialogue. The more carefully composed Song of Lawino is by far the stronger of the works, but even if Song of Ocol is almost crude in its simplicity, there is still considerable power to it. In clinging so firmly to specific (and extreme) positions, Song of Lawino and Song of Ocol might seem facile, but there is considerable art and, on some levels even subtlety, to them. They remain powerful works that are well worth revisiting.